A new application has just been made available for public beta. Iconify, comes to us from the same developer of FileScout, Matthias. 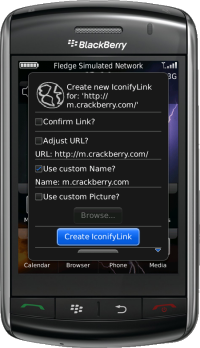 The basic principle of Iconify is to allow you to create quick access links to all of your favorite contacts and websites, making you and your BlackBerry more efficient then ever. With Iconify you can make homescreen icons for one of 3 methods of communication. IconifyDial, which allows you to pick and create icons for calling your contacts. IconifyMail, which allows for quick access emailing, SMS, pin messaging. And finally, IconifyWeb which allows you to create instant weblinks to your favorite websites. All of which are user customizable with pictures, web icons. Since this is a free, public beta user feedback is greatly appreciated. At this time all devices with OS 4.3+ are supported and you can read the full break down of Iconify and it's options via the site or in the CrackBerry forums as well you can take a look at the user manual. After having used the app for a few days now, I can definitely say its made things a whole lot easier for me, so be sure to check it out.